Bummer! I missed my PT at 91.00 on this short trade by 5 measly pips before the strong Australian CPI release sparked a strong bounce close to my entry area. I just decided to exit early since price failed to make new lows after what appeared to be a quick pullback to the 92.00 major psychological resistance. Besides, I also wanted to minimize my exposure ahead of the BOJ interest rate statement. After all, Kuroda and his men might reiterate their willingness to ease further if the sales tax hike results to weaker economic growth. I planned on moving my stop to entry during this event but since price was just a few pips away from the 92.50 level anyway, I thought it would be better to book whatever profits I had then. Not exactly the way I imagined my first trade for the year would go, especially since sentiment for the Australian dollar has been very bearish lately. Still, I’m okay with how I managed my risk on this open trade… just a teensy bit bummed out about missing my PT! Got any comdoll trade ideas for this week? Finally entered my first trade for the year! 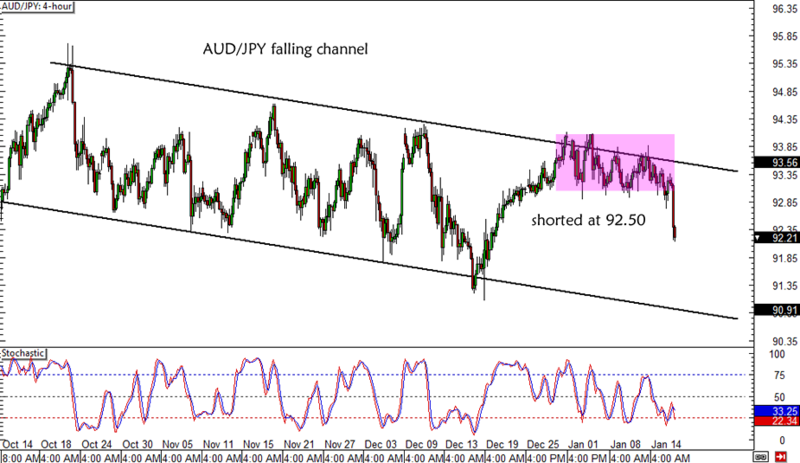 As I mentioned in my Twitter update, I shorted AUD/JPY after Australia printed a dismal jobs report for December 2013. Analysts were expecting to see 10.3K in jobs gains but the report showed a 22.6K drop in hiring. Ouch! The disappointing jobs release was enough to trigger a downside break from the consolidation pattern that has been holding for the past few weeks. This also happens to be around the top of the falling channel on the 4-hour time frame. 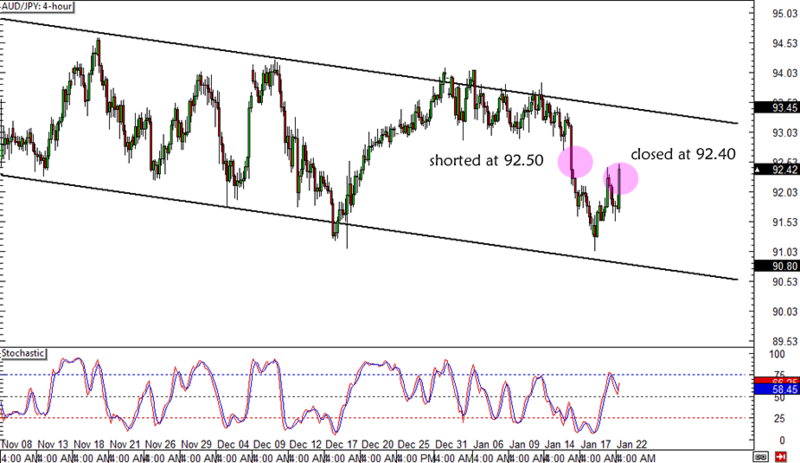 I was able to short around 92.50 so I set my stop above the channel, roughly 100 pips away from entry. I’m aiming for the bottom of the channel near the 91.00 mark, giving me a 1.5-to-1 potential return on risk. Care to share your thoughts on this setup? I look forward to seeing your feedback!